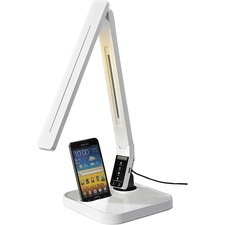 Smart LED Desk Lamp features a built-in docking station specifically for Android phones. LED light features brightness control and four temperature controls (read, study, relax and sleep). Read mode at 5300K brightness stimulates concentration and reduces eyestrain with the choice of mid-range color temperature. Study mode at 6200K increases attention and concentration with the choice of high-range color temperature. Relax mode at 4200K promotes relaxation along with improved mood and the choice of low-range color temperature. Sleep mode at 3300K encourages a deep sleep with the comfort of a soft light. Lamp also features an anti-glare design for eye protection. Articulating lamp head makes it extremely versatile with 180-degree rotation. Lamp includes a 2.0 USB power outlet on the base for charging additional devices.